Studies have shown that a surprise gift of flowers can provide a “pick me up” that lasts for days, and now that it’s officially spring…it’s the time to fill your world with daffodils, tulips, daises, carnations, and all the other colorful flora that shine bright this season. Burton & Tyrrell’s Flowers offers a lovely variety of fresh flowers and creative gift ideas to suit any style or budget. Plus, there are so many holidays and special occasions right around the corner, so let Burton & Tyrrell’s create a custom flower arrangement that fits your occasion perfectly! EASTER – What better way to celebrate Easter than with the candy-colors of springtime? Think you’re too old for an Easter basket? Think again! Order a lush basket of Easter flowers for yourself or any “bunny” who needs a reason to smile! Whether your style is bright and cheery gerbera daisies, or powdery pastel lilies, this Lincoln florist has you covered. GRADUATION – Are you looking to send your favorite student flowers for graduation? Why not send the class flower or a dozen roses to show your pride? Honoring someone’s hard work with flowers is a long-standing tradition. Burton & Tyrrell’s Flowers can help you choose the perfect arrangement for any deserving student. MOTHER’S DAY – Send mom your love this year through a beautiful bouquet of her favorite flowers. Mother’s Day is your time to show mom just how much you appreciate her and everything she has done. Whether it’s here in Lincoln or across the country flowers are the perfect way to say, “Thinking of You” and “I Love You” this mother’s day. WEDDINGS – Premium, fresh flowers and upscale floral artistry are sure to leave a lasting impression on your wedding day. Special care is taken to ensure the bouquets and on-site floral décor reflect your individual style and budget. Whether you prefer timeless or a sleek, contemporary look your special day is sure to come to life with the help of the talented and experienced experts at Burton & Tyrrell’s Flowers. 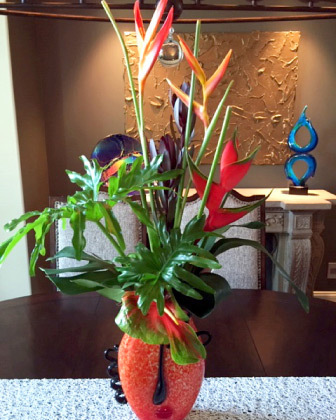 BIRTHDAYS – Whether you’re looking for a gift or party decor, floral arrangements are a great way to make a statement. Out of town on their birthday? Don’t let that stop you from helping them celebrate. A vase filled with roses, tulips, or daisies (just to name a few) delivered to their work or home will leave them grinning from ear to ear! ANNIVERSARIES – Burton & Tyrrell’s Flowers in Lincoln has gifts and flowers perfect for any anniversary, whether it’s your first or your 50th. Anniversary flowers are always a great way to remind that special someone how much you care. Roses are a classic way to say “I Love You” on your anniversary, while a custom floral arrangement always makes a perfect surprise. Top off your unique anniversary gift with a balloon bouquet that is sure to add a smile. Burton & Tyrrell’s is owned by Gary Tharnish, a local florist with nearly 40 years of experience in floral arrangement and member of the Nebraska Florist Society. Burton & Tyrrell’s offers a user-friendly online shopping experience with secure 24-hour ordering right at your fingertips. The store will assist you with any local or worldwide deliveries, and corporate accounts are welcome as well. For your convenience, Burton & Tyrrell’s offers daily floral delivery to local funeral homes and hospitals.